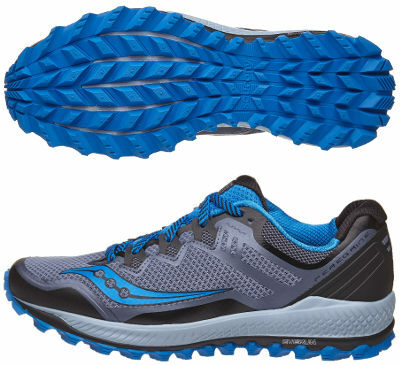 Saucony Peregrine 8 are neutral trail running shoes. The versatile Saucony Peregrine 8 gets several updates but none of them is a midsole enterely made of EVERUN as premiered in premium running shoes from american brand like Triumph ISO 4. General features like limited weight, just 4 mm drop and low stack height allow the Peregrine 8 to perform well on most terrains with agility, but expected special editions like ICE+ (specific outsole for ice tracks) and RUNSHIELD (water resistant upper) complete lineup for more complicated scenarios. One of the major changes compared with its predecessor Peregrine 7 takes place in the upper with three new stripes embracing midfoot (similar approach as latest ISOFIT solution seen in premium road running shoes from Saucony) instead of the TPU structure for a more secure and snug fit. What do not change are the gusseted tongue to prevent debris and dust from jumping inside and reinforced toe cap to keep toes safe. As well as its bigger sibling Xodus ISO 2, interior lining from both ankle collar and tongue are made of RunDry™ materials for great breathability and odour control resulting in optimal sanitation. The other major change in Peregrine 8 is the introduction of the PWRFOAM as main component in midsole instead of well-known SSL EVA keeping full length EVERUN layer on top of it for responsive cushioning, same configuration applied in Ride 10. Last but not least, impressive PWRTRAC outsole features 6 mm lugs with a TRI-FLEX similar design in the forefoot (no rock plate any more) to provide great grip even on wet surfaces.